Gazi Mahir Ahmed Naven ’19 recently attended the Society of Asian Scientists and Engineers (SASE) National Conference. 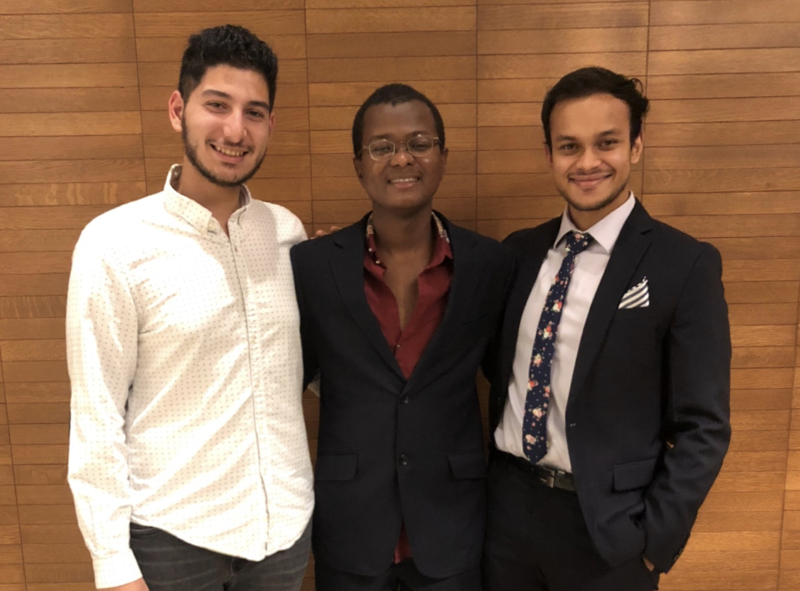 During the conference, he and his team also competed in SASEtank – a pitch competition, where they presented UPTICK, a data-driven affordable marketplace for student essentials. Read more about his experience here. After going through a three-round, four-month long process, we finally made it to the finals of the SASEtank business competition (organized by the Society of Asian Scientists and Engineers, or SASE). In the spring, we finished 2nd in the Forbes Entrepreneurial Competition at UR with the idea for our business. UPTICK was turning into a reality and we were finally ready to present our venture, a data-driven affordable marketplace for student essentials. 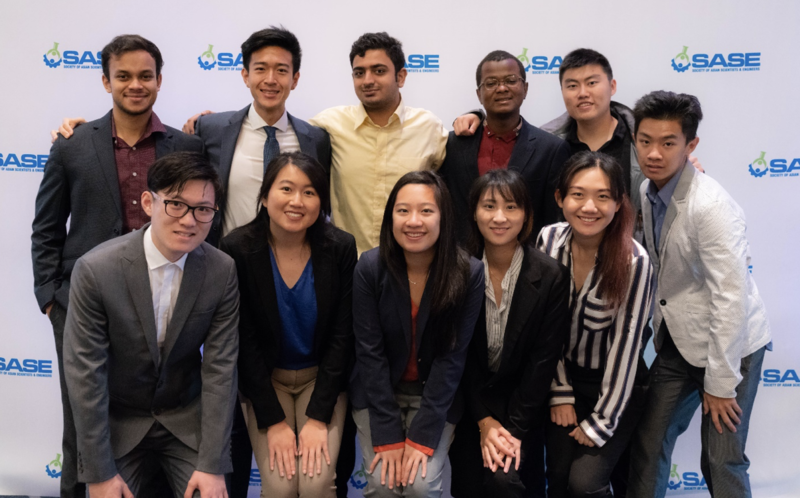 My team and I were fortunate to find that the University of Rochester’s SASE Chapter planned to attend the SASE National Conference in Chicago, where our pitch for the finals was going to take place. This was a great opportunity to attend the conference, which attracted over 2500 students (representing 130+ universities) and industry professionals. 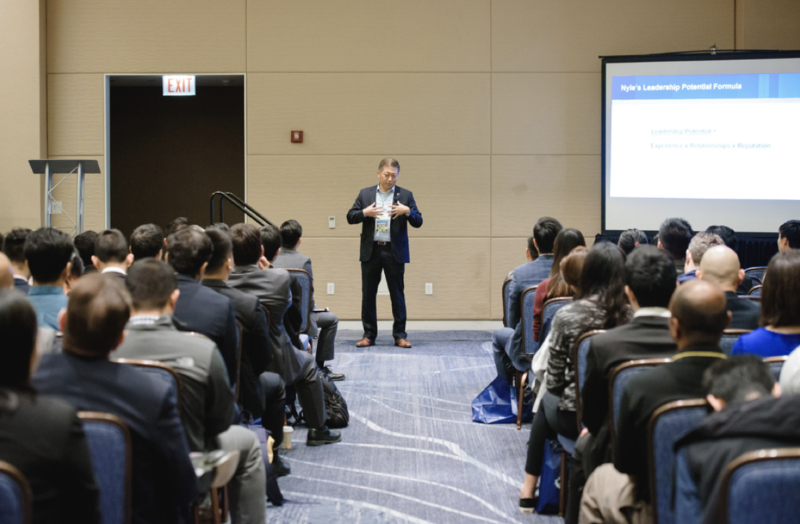 Not only was it a great opportunity to network with diverse individuals within the Asian community, but also to attend workshops led by professionals working in cutting-edge businesses. UPTICK co-founders Sidhant Ahluwalia, Babaye Yahouza, and Gazi Naven. One of my favorite workshops was led by Nyle Miyamoto, Additive Manufacturing Chief Engineer at The Boeing Company. His talk went over the importance of leadership in workplace. What I found most interesting was his formula for climbing up the ladder in a big firm: progression in workplace is a multiplication of how much experience, number of relationships, and the reputation one has. He emphasized that this simple concept can often explain why a lot of Asians – despite their experience and work ethic – aren’t in managerial positions in big firms. He finds that Asians are not usually striving to build relationships or the reputation of the firm. Hence, he urged Asians to not only work hard at the job, but to also on break the cultural barrier that stops them from taking more initiative to build their reputation and relationships. Nyle Miyamoto speaking of leadership potential and his formula for success. Nyle’s words kept me inspired leading up to the SASEtank business competition. We were the last to go among the five finalists. I was prepared for it, but still a little nervous about being able to finish on time, since we only had 3 minutes to present. After our clear and concise presentation came the 7-minute-long session of questioning from the judges. While some were just clarification questions, I appreciated how many of their inquiries became discussions as we answered them. These discussions led to valuable comments and interesting ideas that we may begin to implement. While we did not end up winning, this opened space for advice and networking with the judges. One of my conversations led me to David Pan, who previously worked at P&G and Amazon, and now works as COO for MyIntent Project. From him I learned how you can create a demand in the market, a strategy MyIntent Project used. We talked about how UPTICK could benefit from doing something similar. University of Rochester SASE Chapter members. In addition to the delicious food that was served during the conference, I came to meet new people and learn about different perspectives. I was given feedback for my own professional development through resume reviews with Boeing and Leidos, and I was able to practice giving elevator pitches at the career fair. It was a breathtaking experience to take myself and our entrepreneurial venture out from the college bubble and into the real world. Gazi Mahir Ahmed Naven ’19, originally from Bangladesh, is a senior at the University of Rochester, double majoring in Data Science and Economics. He is the CTO and Co-Founder of UPTICK, a student-only marketplace with advanced analytics. Naven is passionate about developing technology to create convenience and business value. This fall, the Ain Center for Entrepreneurship partnered with the Gwen M. Greene Center for Career Education and Connections to facilitate an entrepreneurship trek to New York City. A small group of students and staff travelled to a number of startups and scaled companies over two days in October to see how innovation functions in different settings. MS in TEAM student Akshay Rajput shared some insight on the trip. Read more about Akshay’s journey here. 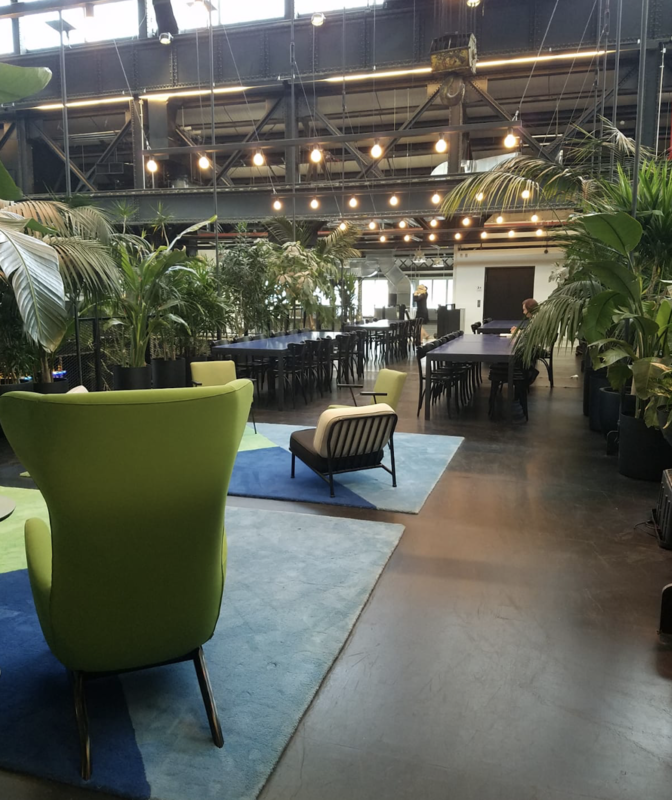 It was fascinating to see the vast amount of opportunities that a startup is surrounded with at WeWork and the spontaneity that comes along with it. Efficient workspace utilization, supreme community-building environment, constant employee feedback, and flexibility in scaling are all important factors that make WeWork successful. Additionally, The Company’s aim to base the entire building around a tech-central theme and create proximity to the startup community by dedicating 250,000 square feet of space in midtown Manhattan was inspiring. Tyler Schrodt, CEO and Founder of Electronic Gaming Federation, apprised us about the changes he made in his business plan, improvements made in product quality, customer targeting, and economic models – along with his journey of gaining streaming rights and construction of their revenue policy. 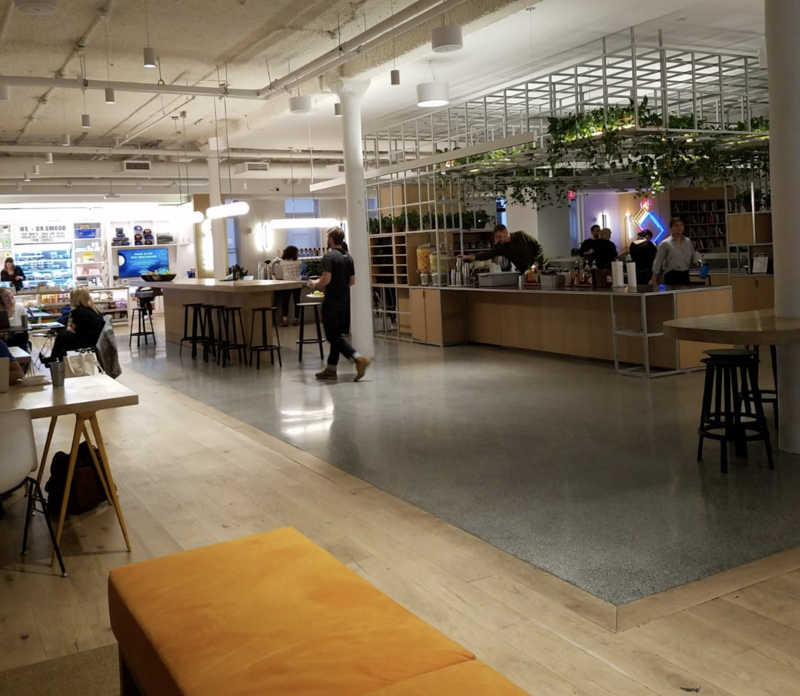 Common area for members in WeWork Corporate Headquarters of Manhattan. 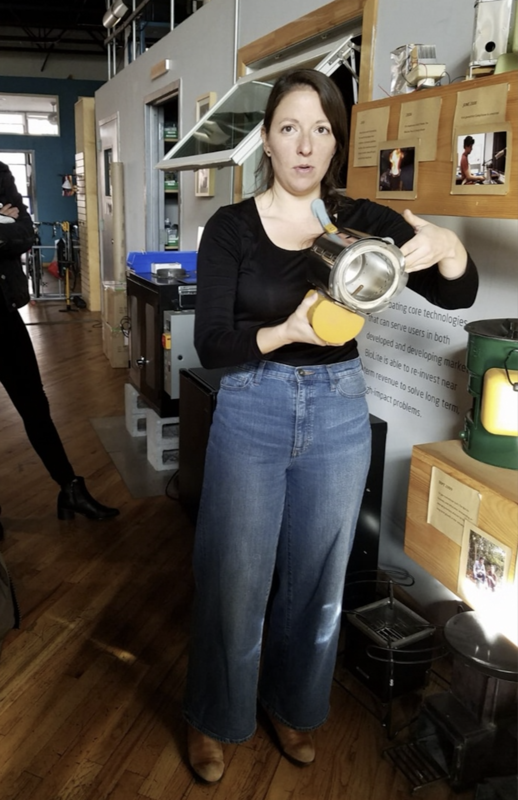 Erica Rosen, Director of Marketing at BioLite, enlightened us with their compelling mission to transform the way we cook, charge, and light our lives off the grid with their line-up of revolutionary products built on sustainable business practices that have the power to change the world. Their unique Parallel Innovation business model made them stand out from the rest of the companies on the trek. In the Brooklyn Navy Yard, we were captivated to see what New Lab has achieved with the historic former machine shop by creating a breakthrough ecosystem of shared resources where startups, entrepreneurs, business leaders, and city officials can collaborate, iterate and prototype their innovative ideas quickly with the help of CNC and 3-D printing machines on-site. Erica Rosen, Director of Marketing at BioLite, showing us their CampStove. The interesting panel discussion with Swarnav Pujari (CEO of Touchlight Innovations) and Joel Cettina (CEO of Food Moves) gave us insight into their entrepreneurial journey, which highlighted the key learnings from their failures and successes. Ke Cheng, Founder and CEO of Histowiz has staggeringly created the world’s first telepathology network that incorporates machine learning offering rapid turnaround times and unprecedented access to a wide range of pathology subspecialties. Collaborative space at New Lab, a space in Brooklyn supports entrepreneurs working in advanced technology. U of R’s Ain Center for Entrepreneurship and Gwen M. Greene Center for Career Exploration and Connections efforts enabled us to see the theoretical concepts taught in the Technical Entrepreneurship and Management program being implemented in real life which, in turn, immensely helped in broadening the scope of thinking. Akshay Rajput ’19 (MS) has been working with multinational companies since his graduation. He holds expertise in field of business development, marketing, and resource management. Akshay’s latest experience stems from being a digital media & business development manager for a branding firm. He is currently a Masters candidate in the Technical Entrepreneurship and Management program, with a concentration in Energy & the Environment. People are the most important thing. Business model and product will follow if you have the right people. On Monday, October 22, the Ain Center hosted the second Foundry Forum, a new workshop series designed to train entrepreneurs. This workshop – The Voice of a Customer: Shut Up and Listen – covered a number of techniques and tricks for interviewing customers to determine market needs at all stages of your venture. We boiled down the workshop into a few key points. The Ain Center’s Foundry Forum series (new for Fall 2018) is designed to supplement existing entrepreneurship classes and programming. These workshops explore the fundamentals of starting your own venture, including how to talk with potential customers to learn about their needs. Our second Forum – The Voice of a Customer: Shut Up and Listen – was held on October 22. Facilitators Matt Spielmann and Max Sims shared their experiences and tips – five of which are below! According to a CB Insights study, 42% of startups fail because there is no market need for their innovation. 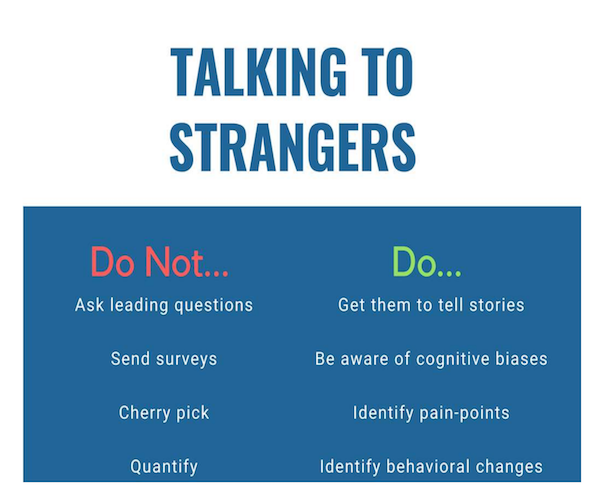 Learning about your customer and asking questions that get to the heart of their problems can help ensure that there will be a fighting chance for your enterprise. Ask Yourself: A Product May Be "Cool," But Will It Sell? Startups face a number of challenges - why add to those by not doing your research? Your venture may be centered on a new high-tech product, but over-engineering can lead to obsolescence. There may be a pain point that your target customer is dealing with but, according to Max Sims, "there's a difference between pain and pain worth solving." Start with your assumptions: what do you think is the problem? Once you have these starting points, create "I believe _____" statements that can be proven true or false. For example, "I believe [my customer] has a problem [achieving a specific goal]." Use interviews to prove/disprove these statements and continue to refine your hypotheses. Ultimately, the goal is to determine whether or not you have a product-market fit. Asking the right questions, limiting your own bias, and keeping an open mind are key to customer discovery. When is the right time to talk to your customers about what they want? ALWAYS. This cannot be overstated. Entrepreneurs need to remain aware of market needs and consumer desires at every phase of their venture. Whether you have an idea that you want to build upon, or a large company launching a new product line, customer discovery should be constant. To summarize, our workshop facilitators put together a handy "how-to" guide. While there is extensive literature on performing customer discovery, these few basics will help get you started on the right path. Chart of basic techniques created by Matt Spielmann and Max Sims for Voice of Customer Workshop in October 2018 (inspired by Talking to Humans, by Giff Constable and Frank Rimalovski). 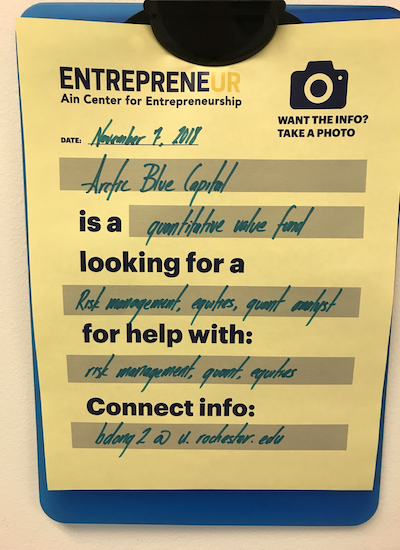 If you have any questions about customer discovery, please contact the Ain Center at AinCFE@rochester.edu or make an appointment with Matt Spielmann. Interested in attending future Foundry Forums or workshops? Head over to our Events Calendar and register online!